I just got a crazy deal on white neck hackles ($1 per 1000), so I bought six packs. I am starting a project where I dye materials with period dyes using WM. Blackers recipes. Of course, some colors I will not be able to dye (red arsenic is probably best avoided), but I will dye as many as possible. While I do not yet have most of the dyes, I went ahead and tried yellow, since I already have turmeric. I am very happy with how these turned out, and Im going to do several more batches today. Thank you! This fall I will collect some walnuts to make fiery brown. Thank you! This should last me a while. "Way to go" Henry, & don't forget to try & get some onion skins next time you go shopping, Also see Bill Bailey's notes on natural dyes. Arkle, I will have to try that. Google images showed a range of good looking browns and golden olives. www.anglebooks.com as ir's easy to mis-spell "coch-y-bondhhu"
I think I will do one more batch today, and sell it on eBay. I have to fund my project somehow! 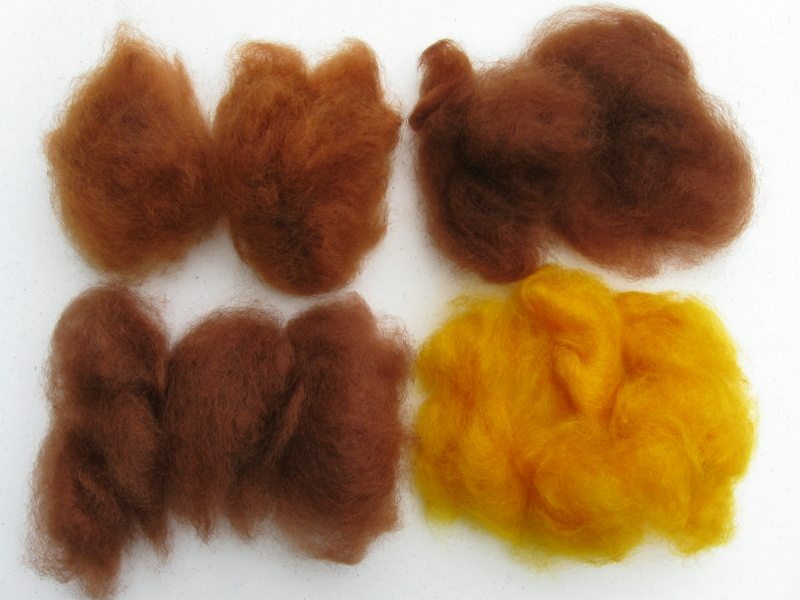 This picture shows four of Blacker's colors on mohair: yellow brown, fiery brown, golden yellow and brown. where did you get the hackles? Thank you! That is a great resource!